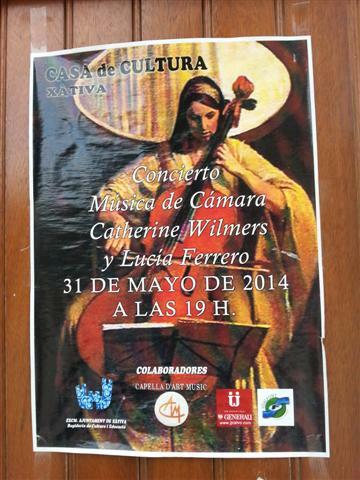 Catherine's CD "A Cello Century of British Women Composers" won the rare "Diapason" gold award and was issued by ASV. Catherine is a professional musician who has played the 'cello (violoncello) in professional orchestras, including the London Philharmonic Orchestra (LPO) of which she was a member for 25 years. (see www.LPO.org.uk/archive/behind.html for Catherine's description of recording music for The Lord of the Rings) She also enjoys playing chamber music such as string quartets, string trios, piano quartets and piano trios, recitals for cello and piano, and solo cello. With actor Colin Greenslade she performed at an evening of poetry with solo cello interludes at Knebworth House. The Montagnana Trio is an exciting Flute Trio with Emma Halnan flute and Kate Elmitt piano which gives regular chamber music concerts with interesting and unusual programmes! "The Magic Carpet" is an exciting cello and piano concert for primary schools taking children on a musical world tour. The children direct the journey by selecting different objects from the "Magic Carpet". Each object represents a country and style of music. There is also a workshop for one class. events, programmes of "salon music" and light classics. Catherine is a cello teacher, teaching all ages from young children to adults, both in schools and privately at her home in North Hertfordshire. Catherine also gives talks to adult audiences - her themes include the neglected women composers featured on her CD (with interesting and amusing anecdotes about researching the music and its composers and making the CD); the life and times of pioneer female cellist May Mukle (1880-1963) and 'The stringed Instruments in the Orchestra with particular bias towards the cello' including stories from Catherine's experiences in the LPO. Read some comments on Catherine's performances (click here). 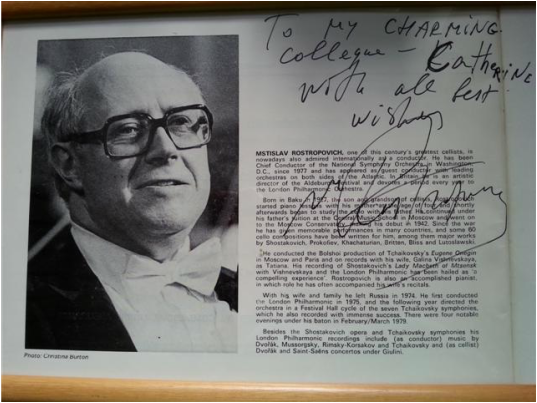 SIR GEORG SOLTI picked Catherine to teach his daughter! One morning mid-rehearsal of the London Philharmonic at Henry Wood Hall she was summoned to his room and invited to teach his daughter on a regular basis at Sir Georg's house! 'Sir Georg would be delighted to give you a glowing letter of recommendation'. Watch this WW1 cartoon with music! Helping out at a student composition workshop led by Michael Eastwood in August 2018. The second link has videos of the musicians! 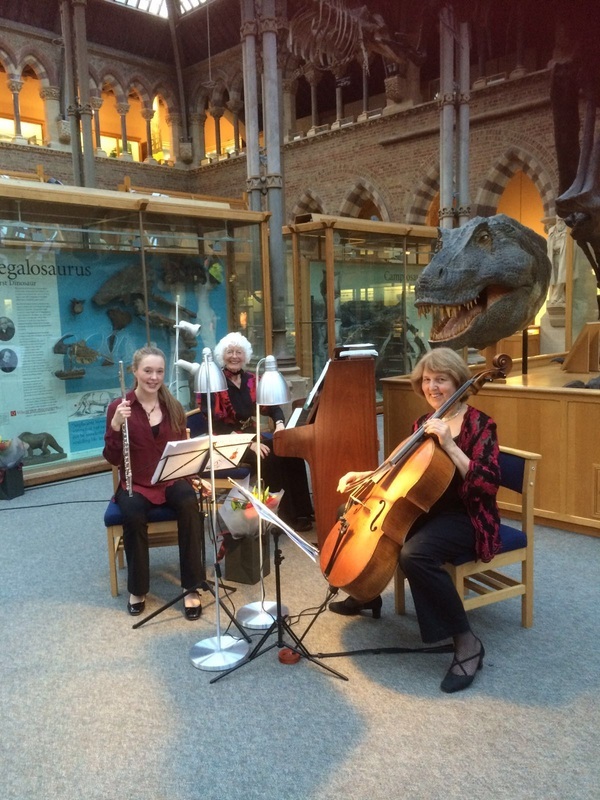 ﻿Cello duets with Carolyn Hopkins-Marti (cello) and Ilga Pitkevica (piano) raising money for Flexicare Oxford (www.flexicare.org) June 2015 at the Oxford University Museum of Natural History. Catherine was chosen to take part in a television commercial for Bassett's Iiquorice Allsorts and had a fabulous day making it at a stately home. The setting was a classical piano trio concert. Bertie Bassett suddenly walks in and offers a bowl of liquorice allsorts to the very smart audience and they jump up and start dancing. The musicians go crazy too!